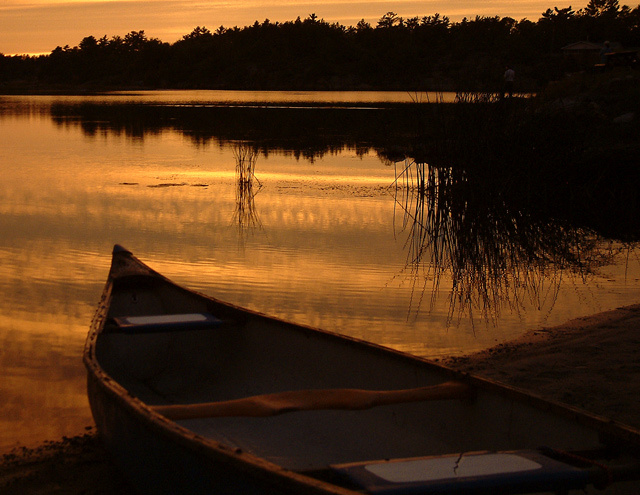 A sunset moment at Sturgeon Bay Provincial Park in Ontario, Canada that we experienced in our recent camping trip. This sunset began very plainly without color or drama, and did not promise to be a good photo opportunity. Sometimes, nature can be very surpising! A stunning view with a great perspective. I like how the point of the boat's hull leads your eye out onto the beautiful golden reflection. Outstanding shot! A delightful and peaceful image with colors so rich. Nice Frame this is my camera too and i most commonly use 200 ASA,must say i like sunscapes. Thank You. Congrats on your first ribbon...I know just how you feel:) this is a wonderful shot. Thanks everyone; your comments are muchly appreciated. Nicely done, a well deserved win. This shot makes me want to be at rest! Very nice! Congratulations! Way to go! It's a beautiful shot, and I'm so glad it won a ribbon. Congratulations Linda on your first ribbon. This photo is beautiful, I love the warm tones. A perfect fit for the challenge, nice composition and exposure! My favorite so far. Stunning composition and wonderful colors. I see a ribbon here! Great Lighting, I love the colors, great reflections. good contrast. beautiful capture. love the colors. Stunning. This succeeds for me because it allows me to place my own story/ dreams into it. Love the content and the colours. Composition isn't spot on for me, though the content is strong enough that it's still wonderful but I'm curious as to whether you took any others of different compositions in same place? I love the colors of this shot. Great work! 10, good luck. Great shot! Fit the challenge to a tee! It brings even more than calm to me being a canoe lover. :-) Technically perfect shot and the colors are fab! This is a calm photo, and a great photo -- but I saw the challenge as to show "at rest". I can't see a canoe being "active" yesterday and "at rest" today. You may take it out and move it -- but in itself doesn't move and change states. Just my opinion. If there were a challenge for "calmness", you'd rank much, much higher. The water adds to the "rest" feeling in this image. Beautifully done. 10 from me. I'm not sure, but this looks a tad oversharpened. Great scene and beautiful colour. I would have liked to see more sky (it lokks AWESOME) and maybe even a bit more lake. Nice job! Very serene...I really like the golden hue....very crisp and sharp. Proudly hosted by Sargasso Networks. Current Server Time: 04/24/2019 09:50:25 PM EDT.